Well screens are used in down-hole applications to filter particulate matter out of produced fluids. 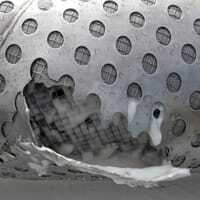 They are typically stainless steel wrapped over base pipe and perforated with hundreds of holes. During use, as more and more particles are filtered out, the screens build a “cake” on their exterior, restricting flow or plugging the screen completely. 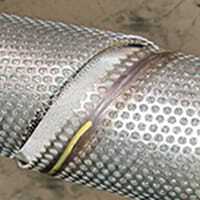 A back-flush or acid wash may be used to clear blockage, but these techniques require subjecting the screens to abnormal pressures. Stress Engineering has an extensive history of conducting industry standard well screen proof testing to qualify manufacturer’s product lines. The process involves using a plugging “pill”, which is a water-based gel with a distribution of particle sizes, to bridge across the filtration slots or holes in the screen media. These pills are designed to fit each specific screen geometry such that the largest particles fill the gaps, and then smaller particles fill voids around these larger particles, eventually creating a seal. A bending moment or Dogleg, in °/100ft, can be applied to a screen sample in order to determine the effect of bending moment on the screen gap opening, screen/base pipe interface, etc. The moment is applied using a 4-point bend method where a force is applied in two locations while the sample is restrained at the ends. An axial load is applied to a screen sample. The load path can be concentrated through the base pipe or from the base pipe to the screen surface. The load can also be increased to screen failure. Typical maximum load is 2,000,000 lbs however, 6,000,000 lbs is achievable. A portion of the shroud is held in a fixed position while tension is applied on one end of the base pipe. Also known as a jacket tension, or shroud tension test. A test that is performed on a short section of wire wrap screen that is usually about 12 inches. The base is pushed through a hole as the wire wrap reacts against the hole perimeter. The force is then increased until the wire wrap slips on the base pipe.